Understanding Afghanistan and Pakistan today starts with grasping the basics about their interconnected histories, including the roles other powers have played in this region. The situations we see today have deep roots. Some of the story lines are sadly familiar, with mistakes and tragedies repeated. 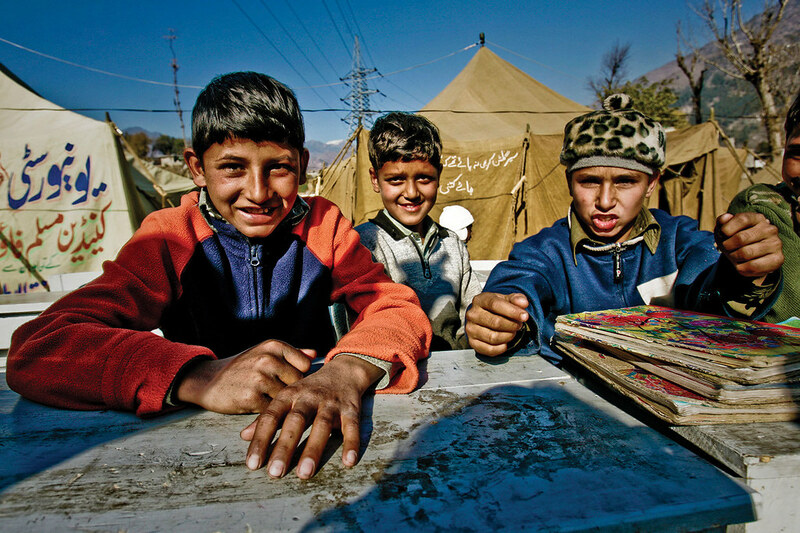 On a post-earthquake relief trip to Pakistan in 2005, Benjamin J. Myers '05 photographed these boys in a camp for displaced persons. EMU’s Center for Justice and Peacebuilding (CJP) has conferred MA degrees in conflict transformation on four Afghan students – Parwiz Ahmad Hakim, Saeed Murad Rahi, Nilofar Sakhi, and Abdul Latif Salem – and five Pakistani students – Ali Gohar, Syed Abrar Hussain, Jennifer Jag Jivan, Kamal Tipu, and Hassan Yousufzai. All nine of these alumni studied at EMU on Fulbright scholarships. Seven are currently in their home countries working for peace in their different professional sectors. Of the remaining two, Hussain is getting an MBA at the Wharton School in Pennsylvania and Yousufzai is transitioning to a four-year assignment with the Pakistani diplomatic corps in Germany. Four students whose work is based in Afghanistan are currently earning masters degrees in conflict transformation at EMU. CJP is linked to 36 more people with work experience in Afghanistan and Pakistan. Some are CJP faculty or staff members, but most are people who took CJP classes for non-degree purposes. These students attended CJP’s annual Summer Peacebuilding Institute (SPI) or took Strategies for Trauma Awareness and Resilience (STAR). We at Peacebuilder magazine tried to contact by e-mail all 49 of these people in January 2010, seeking their input for this issue. Thirty of them – 10 from Afghanistan, 15 from Pakistan, and five who travel to the region for work purposes – responded to our e-mailed questionnaire or otherwise provided their views. Many of these respondents do their work under difficult, sometimes dangerous, circumstances. Yet all gave permission for their names to be used. From the days of the Persian Empire (circa 500 BC) – through conquerors Alexander the Great, Genghis Khan, and Tamerlane – right through today, war parties have flowed over what is now known as Afghanistan in their quest to dominate Central Asia. In 19th century Afghanistan, the British Empire and czarist Russia maneuvered against each other, sometimes fighting directly and sometimes through proxies, in what historians often call “The Great Game.” In the late 1800s, a Russian governor-general encouraged a Sunni-Muslim of Afghan origins, Abdur Rahman Khan, to challenge the British in Afghanistan. The British pulled back and recognized Khan as emir, though they retained control of Afghanistan’s foreign policy. Khan positioned Afghanistan as a buffer between the Russian and British-Indian empires. To keep the British at bay, he agreed to a 1,610-mile border called the Durand Line in 1893. The line had no ethnic or geographical basis – the Pashtun and the Baloch peoples, among other tribes, sprawled across vast territories. In 1947, when India ceased being a British colony, Pakistan was carved out of the Muslim-majority areas in the eastern and northwestern regions of India. The northwest part is now Pakistan; the east is now Bangladesh. To this day the people living on either side of the Durand Line tend to live as if there is no border. Indeed, current life in this “Af-Pak Tribal Belt” is akin to the Wild West in pioneer America. This is where terrorist groups, notably al-Qaeda, run training camps that attract Islamic extremists from all over the world. From Khan’s death in 1901 until 1978, a succession of Afghan royal rulers worked to establish Afghanistan in the family of modern nations. They got control of Afghanistan’s foreign policy from Britain on August 19, 1919 (celebrated as Afghanistan’s Independence Day.) These rulers abolished the traditional Muslim veil for women, began to give women educational opportunities, and set up a two-chamber legislature underpinned by a constitution. Some of the social changes challenged the cultural and religious practices of the majority of the population living in rural locations, along with the stature of their leaders. Resistance grew. The majority of Afghans saw no improvements to their lives, which fed the resistance. Most Afghans lived in extreme poverty, with high infant mortality rates and non-existent government services. Instability reigned. Into the breach moved a Russian-backed political party, the People’s Democratic Party of Afghanistan. This party came to power in a coup in 1978. But it was unable to retain power without overt intervention by the Soviet Union. On December 24, 1979, Soviet forces landed in Kabul. Soviet aid to Kabul’s communists totaled over $1 billion in 1980 alone. The U.S. supplied massive amounts of arms and money to leaders of the rural-based fighters known as the mujahedin. To avoid a direct clash with the Soviet Union, the U.S. sought to channel its “aid” through Pakistan. The CIA bought weapons from China, Turkey (selling WWII vintage rifles, machine guns, pistols and ammunition), Poland and Egypt (both pawning old Soviet-supplied weapons), and other non-U.S. sources to disguise the U.S. role and make the build-up look like Pakistan’s work, according to Ghost Wars: The Secret History of the CIA, Afghanistan, and Bin Laden, from the Soviet Invasion to September 10, 2001. Pakistan cooperated with passing along the CIA’s weaponry and funding for its own reasons. Two years before the Soviet invasion of Afghanistan, General Mohammad Zia-ul-Haq seized power. Putting Pakistan under martial law, he fostered the Islamization of Pakistan’s political and cultural life. “Many of today’s problems – the militancy of the religious parties, the mushrooming of madrassas and extremist groups, the spread of drug and Kalashnikov culture, and the increase in sectarian violence” took root and flourished during the 11 years that Zia was in control, wrote Pakistani journalist Ahmed Rashid in his 2009 edition of Descent Into Chaos – The U.S. and the Disaster in Pakistan, Afghanistan, and Central Asia, a New York Times bestseller. In the process, massive sums were skimmed off for the bank accounts of Pakistan’s elite, for Pakistan’s nuclear program, and for ISI-backed insurgencies to spread Pakistan’s influence into Central Asia and to weaken India. “Between 1982 and 1990 the CIA, working with the ISI and Saudi Arabia’s intelligence service, funded the training, arrival, and arming of some 35,000 Islamic militants from 43 Muslim countries in Pakistani madrassas to fight the Soviets in Afghanistan,” said Rashid, who is also author of the non-fiction bestseller Taliban. This “was to sow the seeds of al-Qaeda and turn Pakistan into the world center of jihadism for the next two decades,” he added. Under domestic and international pressures, the Soviet Union withdrew from Afghanistan in 1989, leaving a shattered country. Rashid estimates that up to 2 million Afghan civilians were killed, while over 5 million fled their country to Pakistan, Iran and other parts of the world. By the mid-1990s, much of the Afghan population was prepared to support any group that could establish law and order, thereby permitting them to plant crops, market their goods, raise their children, and find a way to survive. Backed by Pakistan’s military establishment, the Taliban seized power, promising a rejection of the decadence of the modern world and the re-establishment of strict, traditional Islamic practices. Upon installing themselves in Kabul in 1996, the Taliban declared the Islamic Emirate of Afghanistan. The group was draconian in every respect. Women were forced to conceal themselves from head to foot and to remain cloistered in their homes, unable to work or to attend schools. People who dissented were stoned or otherwise killed in public. Thieves had a hand or foot amputated. Minority groups, such as Afghan Christians and the Hazara were ruthlessly oppressed. Internationals, even the ones staffing non-governmental aid groups, were not welcome. Then on September 11, 2001, the Taliban’s allies, al-Qaeda led by Osama Bin Laden, launched attacks on sites in two U.S. cities. In Ghost Wars, Steve Coll said Bin Laden chose to keep the attacks secret from Taliban leadership until afterwards. The groups were structurally and ethnically separate for the most part. Though the Taliban benefited from huge amounts of money funneled to them by al-Qaeda and Saudi Arabia, the Taliban remained mostly Afghan, drawn largely from the Pashtun tribe, and had a nationalist agenda, while al-Qaeda, with its influx of Arab fighters from many countries, had worldwide ambitions. President George W. Bush’s first response to 9/11 was to order U.S troops to rout the Taliban from its seat of government and to hunt down Bin Laden. The first was done in short order through bombings, but the second never happened, probably because it was relatively easy for Bin Laden and his followers to disappear into the lawless Af-Pak Tribal Belt (the U.S. felt it could not militarily encroach upon Pakistan, a country viewed as a U.S. ally). Afghanistan had to be rescued from itself. Autocratic regimes in Pakistan and Central Asia had to change their repressive ways and listen to their alienated and poverty-stricken citizens. Iran had to be made part of the international community. The West had to wake up to the realities and responsibilities of injustice, poverty, lack of education, and unresolved conflicts such as those in Kashmir and Afghanistan, which it had ignored for too long and which could no longer be allowed to fester. The West and democratic-minded Muslims had to help each other counter this new and deadly form of Islamic extremism. Instead the United States abandoned impoverished, war-torn Afghanistan to nothingness, leaving only the Islamic extremists to fill the vacuum. It was a repeat of what was done 20 years ago, after the Soviets were forced to withdraw. “Security in Afghanistan was handed over to warlords and drug barons, who were supported lavishly by the CIA and the Pentagon,” said Rashid. Meanwhile in Pakistan, the United States embraced an autocratic, unelected ruler and a powerful military, viewing both as allies in keeping tabs on Afghanistan. “Ninety percent of the $10 billion in aid that the United States has provided Pakistan with since 9/11 has gone to the military rather than to development,” wrote Rashid. Afghanistan contains some of the worst living conditions in the world. In its November/December 2009 report, the Afghan Independent Human Rights Commission noted that around 42 percent of its citizens are unemployed and more than 36 percent earn less than the equivalent of one U.S. dollar per day. Seventy percent lack access to safe drinking water. In a 2004 report, the UN Development Programme ranked Afghanistan 172nd out of 178 countries listed. The country had the highest rate of infant and toddler mortality in the world, with 250 out of 1,000 dying before they reached the age of five. If, along the lines of the Marshall Plan, the United States and its allies had combined their knowledge and funds to rebuild Afghanistan beginning in 2002, the current war probably would not have developed. But Bush administration officials showed no interest in this approach, preferring to turn their attention to invading Iraq. Moreover, the United States had (and has) no agency or group with the expertise and mandate to help shattered countries to their feet. The stark reality is that the United States does not have the right structural capability to stabilize and rebuild nations. Responsibility is diffuse and authority is uncertain. The proper roles of the military and civilian agencies have not been articulated. And civilian players desperately need a ‘unified command’ structure to align policies, programs and resources. While Washington poured billions of dollars into military efforts, it allocated pennies, by comparison, to development. And these pennies went into small “quick-impact projects,” such as digging a well, rebuilding a small bridge, or repairing a broken-down school building. These failed to persuade the Afghan population that their future looked brighter without the Taliban, especially since such projects often were done without asking the community if this is what they wanted and needed. Actually, the Afghan government needed pooled donor funds for building roads and power plants and other expensive infrastructure. Such pooling can also minimize duplication of donors’ pet projects. In the first four months of 2008 thirty businessmen were kidnapped in Kabul alone and some ransom demands were as high as U.S. $3 million…. In the first nine months of 2008 twenty-three World Food Program convoys were attacked and eight hundred tons of wheat lost…. The educational system – the country’s biggest success story – was also hit hard. Eighty-eight schools were attacked by the Taliban, while six hundred and forty closed their doors after receiving threats. While Afghanistan was spiraling downward through 2008, Pakistan was stable in comparison. The Islamic extremists operating out of the border regions kept their eyes focused on: (1) Afghanistan, (2) the battle with India over Kashmir, and (3) in the case of al-Qaeda, the wider world. This appeared to suit those leading Pakistan at that time, since little or nothing was done to cause the extremists to leave Pakistan or to put down their arms. On the contrary, Ahmed Rashid, Steve Coll and other informed observers said that Pakistan’s ISI continued to provide arms and funding to the extremists. The 2008 elections in Pakistan brought two non-military men into the roles of president and prime minister. In 2009, after the new Obama administration had assessed the situation, Washington began to put pressure on Pakistan to quit permitting the Af-Pak Tribal Belt to be a hiding and training area for the Taliban and al-Qaeda. Once President Obama endorsed a U.S. troop surge in Afghanistan, he did not want to see the Taliban disappear across the border to Pakistan, where it could regroup and later return to Afghanistan, as had occurred earlier. By late 2009, Pakistan had demonstrated a shift in policy by moving troops and police into some of the border regions in an effort to assert control over them and to make the border with Afghanistan less porous. As a result, there has been a backlash in Pakistan, with terrorist attacks increasing throughout the country. It appears that Pakistan’s own version of the Taliban, rooted among the Pashtun living along the border, has shifted its attention to de-stabilizing Pakistan itself. 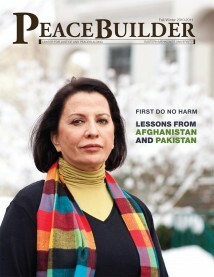 As Peacebuilder magazine went to press in March 2010, it was clear that there was some difference in the outlook of the Pakistani alumni and Afghan alumni of EMU’s Center for Justice and Peacebuilding. In the wake of recent changes in U.S. foreign policy, the Pakistanis were expressing alarm at the increased violence in their country, while the Afghans were expressing cautious optimism for the future of their country. Most of the Afghans had a favorable view of President Obama’s decision to commit more U.S. soldiers to Afghanistan, boosting the NATO force there to 86,000 this spring, 55% being U.S. They saw this step as a necessary temporary measure, though they stressed that only nation building – that is, economic development coupled with reinforcing Afghan systems for establishing and maintaining justice and democracy – could drain the swamp supporting Taliban, al-Qaeda, and other autocratic groups, including those led by tribal-based warlords. Almost all of our alumni are demonstrating in words and deeds their personal commitment to stopping the cycles of violence that have rolled across their nations. Some are working with the schools to reach young people. Others are working to lay an economic base for a peaceful society. Many are working with the media and with government agencies (sometimes at very high levels) to bring about positive, lasting changes. When in the United States, they often join EMU professor Lisa Schirch to urge the U.S. government to shift to “do no harm” (but do help) policies. EMU is a liberal arts Christian college with core values of peace and sustainability.